Sealaska Heritage Institute (SHI) has invited a young Tlingit fisherman and his grandfather to accept an award from the Juneau Economic Development Council and the Alaska State Committee for Research (SCoR), which announced the induction of the traditional wood halibut hook into the Alaska Innovators Hall of Fame last week. Thomas George, a master fisherman and hunter, and his grandson, Thomas Barlow, both of Klawock, will accept the award on behalf of northern Northwest Coast people at a ceremony on Wednesday. George trained Barlow to fish handmade hooks as a child and today, at the age of 14, he is an accomplished halibut fisherman who is deft at landing the fish with hooks. SHI staff learned about the pair in 2016 while doing research for a book about traditional wood halibut hooks, which will be published by SHI this year, said SHI President Rosita Worl. Worl noted the young man knew how to use “line-ups,” a traditional technique used to pinpoint precise locations for fishing, and that he makes his own halibut hooks. 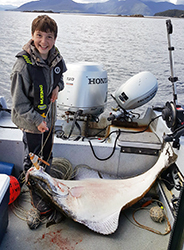 “Thomas’ grandfather passed on the traditional knowledge associated with using halibut hooks, and we were astonished to witness his prowess in locating his family’s traditional halibut holes using line ups and his ability to land fish with the hook,” Worl said. The awards ceremony will open to the public at 4:15 pm, Wednesday, Feb. 21, at the Alaska Innovation Summit at Centennial Hall in Juneau. SCoR created the Alaska Innovators Hall of Fame in 2014 to celebrate and honor outstanding individuals who put Alaska on the map as leaders in innovation and who contribute to Alaska’s growing culture of innovation. The halibut hook was selected because it is a “sophisticated and innovative piece of technology unlike any other fish hook.” Three other inductees also will be honored at the ceremony. Caption: Thomas Barlow with a large halibut caught on a traditional wood hook made during a SHI halibut hook carving workshop. Photo courtesy of Thomas George.